Cheap Apartment, max 4 persons town of Kampor price per day from € 60 Book this comfortable and fully equipped summer accommodation located in a peaceful and quiet part of a small coastal village of Kampor near Rab for a relaxed family vacations in splendid natural surroundings. Entertainment and Sport: outdoor grill, Satellite television. General details: barbecue, parking, outdoor shower. Apartments Slavko town of Kampor price per day from € 65 Please inform Apartments Slavko in advance of your expected arrival time. You can use the Special Requests box when booking, or contact the property directly with the contact details provided in your confirmation. Air-conditioned apartment, with pool town of Lopar price per day from £ 97 If you want to spend your family trip near the sea in Lopar close to Rab, this accommodation is perfect for you. Apartment is equipped with modern household furniture and amenities like wireless Internet, air conditioning and private parking which will make your holiday season in Lopar unforgettable. Distance to the beach: 400 m. Distance to the ferryboat: 25 km. Distance to the train: 85 km. Entertainment and Outdoor activities: TV, Satellite television, radio. 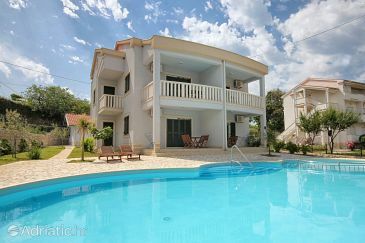 Apartments Anica town of Rab Apartments Anica presents self-catering accommodation situated in Rab. The apartments have an outdoors terrace or a balcony, and a kitchen. At Apartments Anica you will find a back yard and grill amenities. The property is 5 km from Lopar's town centre and sandy beaches. Air-conditioned apartment, close to the beach, Rab town of Rab Book comfortable and budget-friendly holiday apartment positioned in a quiet part of Rab, only 300 m away from the nearest beach. General details: air conditioner, barbecue, parking. Entertainment and Sport: TV, Satellite television, table tennis. 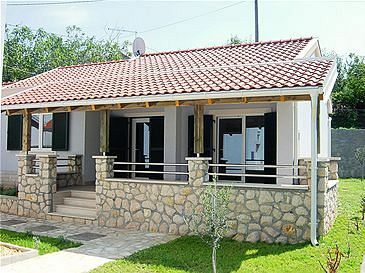 Accommodation, 70 square meters, close to the beach town of Kampor price per day from € 70 Rent this cheap family villa located in a popular tourist destination of Kampor that welcomes you with long pebble and sandy beaches, great gastronomic offer and long promenade that stretches all over to neighboring villages. Entertainment and Sport: outdoor grill, Satellite television. General details: barbecue, parking, outdoor shower. Cheap apartment, 15 square meters, close to the beach town of Rab price per day from € 19 Cheap apartment, 15 square meters, close to the beach. General details: heating, barbecue, parking. Distance to the beach: 450 m. Distance to the restaurant: 70 m. Distance to the shopping center: 780 m.
Bed and breakfast Nika town of Barbat Rab price per day from € 44 Situated in Rab, 27 km from Baška, Bed-and-breakfast Nika presents gratis wireless internet access and free car parking. Certain units include a seating area for your convenience. Some units have views of the sea or back yard. Each room comes with a private toilet. Novalja is 20 km from Bed and breakfast Nika, while Mali Lošinj is 35 kilometers away. The closest flight terminal is Rijeka Airport, 58 km from Bed and breakfast Nika. Hotel Istra town of Rab The family-run Hotel Istra is located in the real heart of Rab's old city, only a few minutes' walk from the sea on Rab Island. It presents free internet access, as well as a café, a back yard dining establishment and tennis courts. Rab has an enjoyable Mediterranean meteorologic conditions. and you can take part in many outdoor adventures. The hotel is linked to the mainland and the Krk Island via ferry and to Rijeka via the catamaran. Car parking options are available for an extra cost. Pansion Tamaris town of Rab price per day from € 44 "Tamaris" is a new hotel, established in 2005, situated right beside the sea, in St. Euphemius Cove, approx. 2 minutes walk to the beach and 10 minutes walk from the old city. 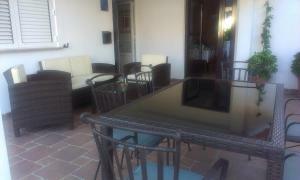 Hotel- Pension "Tamaris" is open all year round and presents accommodation in 14 contemporary furnished double bedrooms. Boat moorings are located in front of the hotel. Visitors can select between morning meal, half board or full board arrangements. Villa Jadranka town of Barbat Rab price per day from € 42 Vacation home Jadranka is located in the beachfront settlement of Barbat on Rab Island. The property is surrounded by a sizable back yard with a sun outdoors terrace and grill amenities. Public bus stops 150 metres away, and the closest pebbly beach is 500 metres away. All apartments are equipped with a balcony looking out over the Adriatic Sea, air conditioning and satellite television. A well-equipped kitchenette and a toilet with shower are included. Free internet access and free car parking are provided. The ancient city of Rab with its innumerable historic landmarks, churches and cultural attractions can be reached within 5 km from Villa Jadranka. The Rab island is one of the most wooden islands in Croatia and is a genuine botanical representation, with trees not native to the Kvarner archipelago. It is loaded with remarkable revelations for the nature fans and tourists. The Island of Rab has lengthy boardwalks along the shore and biking tracks for an active leisure vacation. Tracks are leading past the appealing landscape and exceptional natural attractions. Apart from the medieval town of the same name, there are 7 other picturesque settlements spread over the island: Banjol, Palit, Mundanije, Kampor, Barbat, Supetarska Draga and Lopar. There are approximately ten thousand residents on Island Rab. Island has the heritage of well-organized tourism for a lot more than 100 years. The cultural and traditional highlight of the island is captivating Rab Town, characterised by 4 exquisite campaniles rising from the medieval stone streets. Even at the top of the summer period, when the island is overwhelmed with guests, you nevertheless get a feeling of exploration straying its old quarter and getting away to virtually deserted beaches just a swift boat ride away. In spring season and fall months, Rab Island is a beautiful location to explore, as the weather condition is quite moderate and tourists are rare. The rich year-round schedule of celebrations has something for everyone. We need to point out just a couple of celebrations from the numerous on the program, that provide Rab that something exclusive when thinking about where to spend your vacation: the Rab Crossbowmen and their Mediaeval Tournament, the Rabska Fjera, the Rab Musical Evenings, performances by folk-dance troupes and modern Rab Summer Festival and Rab Fashion Week. There's a remarkable quantity of accommodation easily available on Rab Island. To be in the center of things, hang around in Rab Town but you will pay a much higher price there for both resorts and private accommodation. Palit is just a short walk away and is directly on the beach. Beach fans will prefer to head right to Lopar, site of Paradise beach. For a peaceful getaway, you'll prefer to stay in Suha Punta, an attractive peninsula packed with beaches and surrounded by a shaded beachfront boardwalk. Besides the Christmas period of time when Croatians visit their Adriatic pearl, Rab hotel prices or apartments are up to 30 % less expensive in winter season but due to the fact that just a few are open well-timed reservation is needed. For that reason, you 'd have to ensure that you have a home to stay in forward so contact us and reserve promptly. The island of Rab has a really enjoyable Mediterranean weather condition, with moderate winter seasons and fine moderate summers months. Rab has roughly 90 totally bright days per year and it is one of the sunniest areas of Croatia. The Island of Rab has ideal weather condition if you value the great outdoor activities; cycling or walking. The ideal time to check out Rab island is late autumn/spring season and if you desire something uncommon and amazing - February and March to experience well-known strong wind "Bura". December is typically much hotter than remaining of Northern Europe and temperature levels are around 14-16 degrees celsius. Spring season brings fantastic vegetation and pleasant weather for long strolls and excitement in uncovering different island sceneries or day-excursions. The sea temperature level is remarkably high. That enables the progression of tourism due to the fact that it is possible to take pleasure in it from April until the end of September. The approximative sea temp a year is 15,75C. The approximate sea temperature from June till September is over 22C, and during the winter around 13C. In the tourist offer of the island a significant focus should be placed on several good and extraordinary day tours to get to figure out the island and the landscapes and sightseeing via the old town of Rab, a panorama tour by motorboat, journeys to the neighboring islands: Losinj, Pag, Kosljun, Krk, the sea bottom sightseeing, arranged tours to the national nature parks of Kornati, Paklenica, Velebit and Plitvice lakes. For one-day tours by motorboat, it is good enough to walk down the coastline where nearly all the tour and excursion motorboats are. The rates are from 20 to 45 EUR depending on the tour and the vessel or sailboat. Scuba diving - Scuba diving adventures have significantly improved lately. The variety of guests who considers this type of vacation is growing. A great deal of shipwrecks along with natural undersea attractions have been discovered all over Rab. Besides the basic training course and opportunity to rent equipment there are scuba diving schools in addition to the total arrangement for diving vacations. Mountain biking - A unique adventure on Rab are mountain bike trips. With the wide range of tiny streets, tracks and trails where you can take pleasure in the beachfront, Mediterranean woods and Rab stands for a biking haven for all MTB fans. Sailing and water sports - as a sea resort, the Island of Rab provides fantastic opportunities for nearly all sorts of water sports. The weather in June and September are particularly great for windsurfing, but other months are good as well. Except for sailing you can also rent a variety of motorboats, jet-skies, and canoes. Trekking - In addition to mountain bike rides, hiking and its tracks give a fantastic opportunities to its admirers.